The ideators of the high speed track in the circuit of Monza 1955, Antonio Beri and Aldo Di Renzo had one goal, create a performant track with a very high avarege speed, without having changing of direction and with no use of brakes. the project so, strarted from the idea of the the one built in 1922, but with a modern concept. Finally the "ring" was composed of two half circle of a radius of about 320 meter and two straights of 875 meter. With a slope fo 80 % the car could keep going at 300 km/h all long the circuit. The construction site opened at the half of march was ended at the last of August. A very short time, considering the problem encouterd during the construction; many parts of the track had different highness and often the asphalt was bad, entire part of the track have been complitly rebuilt due to construction errors. 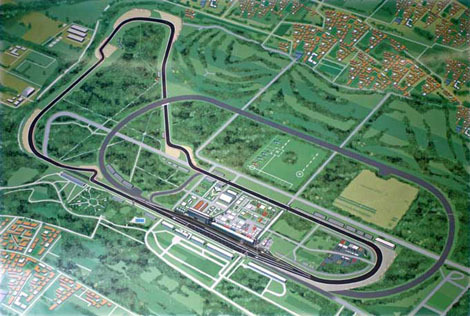 The classic Italian Grand prix of 1955 could be played on the new track, more the classic track for a total lenght of 10 km. The choice was retained un safe from the media. Overall the dramatic events of Le-mans, where 80 persons died was freezing tha atmosphere on the Italian date. Anyway the affluence of spectators have been busy, 150000 at the winning of Juan Manuel Fangio, behind Taruffi and Castellotti. Fangio must even thanks the boycott of English team. The suddend year the course came won from the English Stirling Moss on Maserati followed by Fangio on Ferrari-Lancia In 1957 european formula one car competed with american car in the first edition of 500 miles of Monza. The race was called Monzanapolis - Race of two world The antefact must be searched in the invite to Duane Carter, American Sporting Director, form Bacciagaluppi, Milan automobil club (ACM) chairman. Bacciagaluppi was fashinated by the idea fo the duel between american and european industries. The race was programmed for june 1957, so Pat ÓConnor, american star, came in April for an exciting test that declared Monza the fastest track whit an avarage speed of 163 miles per hour in 226 miles against the 144 miles/h of Indianapolis. Monzanapolis of 57 have been won to Jimmy Bryan. This edition was characterized by the poor partecipation of European team, that, afterall decided to bet on the next appointement. All European team passed the months before the race preparing a competitive car. Pilots like Stirling Moss, Mike Hawthorn, Luigi Musso and Phil Hill decided to not miss tihs events. The pole went to Luigi Musso that fighted with Jim Rathmann, Bryan and Ruttman to keep the first position for the first part of race. Hill, the first american to become world campion of formula 1, told: I was in a very strange sitaution, I was the only american to run for a european team; i liked the race, that all in all was simplier than other circuit like Spa, but the temperature was very hot and the effort for the car was very heavy. American team and pilots was advantaged by their more-resistent cars. I got the third position and this made me satisfied. Rathmann Won the race, followed by Bryan then Phil Hill. Stirling Moss on his Maserati sposored by Eldorado ice-cream, had great performance in the first session then he remeber: Suddenly my arms get crossed, i hit twice, thrice, the guardrail and i was thinking to die; Still today i don't know how i stopped myself. The second edition of Monzanapolis ended in the succes, Big affluence of public, high tecnology content. Unfortunately due to some internal problem of ACM there will no be more Monzanapolis with much displeasure for the American pilots that were looking forward to return in Monza. In the 1959 the track have been used only for less important race. The 1960 is a Ferrari-party that won all the podium, The race was held on all lenght track of 10 kilometers and the success of the Ferrari is even cause to the absence of English team. The next year the crowded strating grid of 32 cars give an idea of the expectation on the race. Every english team prepared well for this appointment. When the race started, after few tour Jim Clarck heat the Ferrarist Von Trips some meter before the elevated curve, Von Trips lost the control of his car from which came ejected. the car hit 13 persons wich died, included Von Trips. 6 year far from the accident of Le Mans another dramatic accident on formula 1 world, Phil Hill this year became world champion, for the following years Monza will never be scheduled for the gp championship. Anyway to assist at "The Monza Renaissance" there is not much time to wait; in the 1965 Monza hosted the 1000 miles. The battle is between Ferrari and Ford, but Ferrari shows its superiority in many occasion, Henry Ford once said: Every Monday morning Ferrari enjoy free advertisment on all newspaper thanks to their victories. At 2 pm of 25 april 34 cars are disposed on starting grid. The track was enterily use, both the ring and the ordinary track. The ring have been "reduced" by introducing a chicane at the entrance of the second elevated. Ferrari diden't leave any space to opponents, obetening the first and second place; Respectively Mike Parkes and Jean Guichet on their "small" 275 P2 and John Surtees and Lodovico Scarfiotti on 330 P2 leaved behind Bruce McLaren and Ken Milles on Ford GT40. The next edition of 1000 miles of Monza started under a strong and unusual rain. The theme of the race was always the fight between Ferrari and Ford. Despite breaks for wipers on Ferrari that reduced visibility, John Surtees and Mike Parkes made a great race, dubbing all the cars and, at least, Masten Gregory and "sir " John Whitmore on Ford GT40. More hope for a better result to Lorenzo Bandini and Lodovico Scarfiotti on the small Ferrari Dino 2 liters, but the problem to wipers leaved them "only" on the ten postion. To note that Monza was a very hard race, just 19 of 40 cars that was on starting grid had completed the race. In 1967 a couple of innovation renewed the challange of Monza. First was represent by the particular model from texas: Chapparell, the car was caractherized by the big back wing. For the first part of race the duel was between ferrari and chapparel, unfortunatly the Chapparel retired soon, due to some problem. the two team on Ferrari, Scarfiotti-Parkes and Bandini e Amon fighted for the win, that went to Bandini & co. follewed by Scarfiotti car. Second innovation from Porsche, absolute third and first in protypes until 2 litrs with Gerhard Mitter e Jochen Rindt on 910. In 1968 the scene was for Ford and Porsche (Ferrari diden't take part to this edition). The 5 liters gt40 showed their superiority on the 2 liters Porsche 910. In fact, when Jacky Ickx, Brian Redman retired from race, due to a problem to their gt40, Paul Hawkins and David Hobbs, on the other Ford, diden't have any problem to take and keep the 1st position until the end fo the race. So Ford could at least, win, for the first and last time, this famous competion. Many expectation the next year on Ferrari. In 1969 the prediction gave the Ferrari winner against Porsche. Pilots from ferrari was Reliable (Amon, Andretti, Rodriguez e Schetty) and the car was powerful and Fast. Probably the success of the Swiss Siffert on Porsche, was due to wrong tyres chosen by Ferrari, furthermore, the Swiss leaved wisely the Ferrari to run up, until their exit at the 39 and 67 lap. 1970 the ring was abandoned because of the increasing powerful of the cars and oversized tyres. The ring have been gradually forgotten until nowdays.